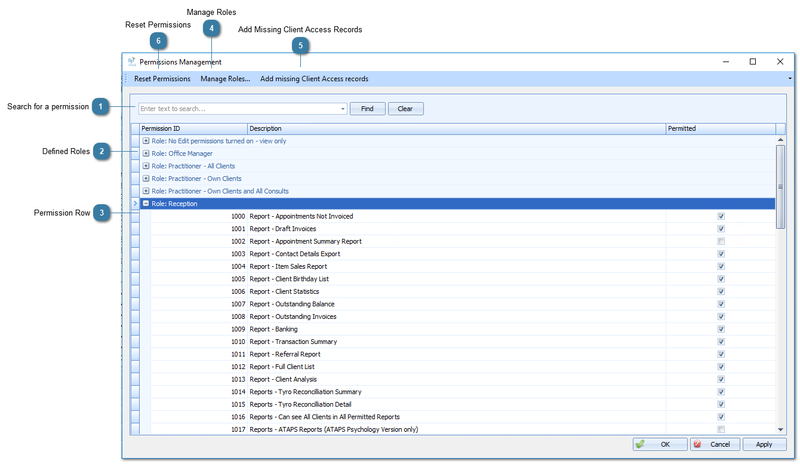 From Version 5, Bp Allied has a new way of managing user permissions. This is done via Roles that have specific permissions or rights assigned to them. There are a number of default roles built into Bp Allied that can be used as is or they can be adapted to suit. This can be accessed via System > Manage Permissions or System > Options > User Administration > Permissions. To restrict a User from parts of Bp Allied a Role must be created to reflect these access permissions. That role can then be assigned to as many Users as required. Videos on Bp Allied can be viewed at Bp Online, in particular Security as introduced in Version 5. Please note that there have been some minor enhancements to this functionality since its original introduction. Please refer to the written documentation. Clients are all displayed based on permissions for the practitioner running the report - if they can View or Edit the client demographics then they can see the client in the report. Custom reports are run independently of client permissions. Task Master Report - System Admin can see all tasks, other practitioners can see their tasks and any for their allocated Clients. Bp Allied provides some defined roles to enable setting up permissions to be easier. New roles based on these can be added. System Administrator - By default there MUST always be one user set as the System Administrator, if there is only one User then this will be the role that is set. This user has access to all functions in Bp Allied and the permissions set against this role are unable to changed. Reception - Access to see all Clients but unable to view History or Consultation details, can run all reports (except custom), unable to delete documents, phonecalls/emails or Clients, can merge all Client info into letters, can change Client Practitioner and Administer Calendars. There are three default practitioner related roles, each with an increasing restricted level of access to Client data. Practitioner (Own Clients - All Consults) - Practitioner is able to access Client information including appointments, demographics, history and consultations for the Clients that the practitioner is assigned to only. If a client is shared between multiple practitioners then this practitioner can see Consultations by those other practitioners too. Enabled permissions are 4005, 4007 and 4022. If viewing the consultations carried out by other practitioners for their clients is required then permission 4010 rather than 4007 must be enabled. All of the Practitioner Roles are restricted from the following: running financial reports, processing refunds, deleting referrers or editing products and services, no Administrative Access (5000 Series) except Change Practitioner if they are the Primary Practitioner. Within each role are a series of permissions that are set in a pre-defined state based on the type of access for that role. These permissions can be changed by ticking or unticking the Permitted check box. Details of the individual permissions can be viewed here for Client Access and here for all other permissions. New roles can be added from here. 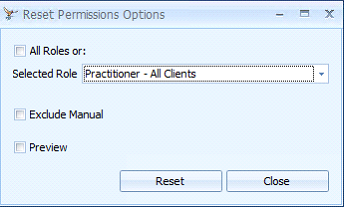 Used when the Client Access permissions for a Role are changed so that the access against each Client in the Client Access table is updated. If your practice has a large number of clients, updating the Client Access permissions on a role by role basis is recommended. Uncheck Preview to continue with the update. A System Administrator user must be selected and password entered to make the change. The number of records updated for the relevant users will be displayed.